my grandfather is almost 51-and-a-half. 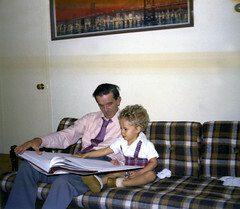 My grandfather died 25 years ago this week. I was 13, he was 62. So I definitely remember him; sadly my memories of his poor health for the last two or so years of his life crowd out everything else. He had a stroke, lost a leg to a blood clot, was able to mostly live at home, but was in and out of hospitals until he passed away. He and my grandmother (who died five years later) smoked a lot, which is oddly comforting, as in my mind it fully explains why they died so young. I need that, because my dad is turning 60 in a few weeks. He doesn't smoke and thankfully he seems to be in good health. I can no more imagine him sick and wheelchair-bound than I can imagine him sprouting wings and flying to the moon. Yet I don't dare ask about how my grandfather seemed when he turned 60; I don't think I want to know. I'll be seeing my parents tomorrow, and I'm thankful for that. My dad was born in 1940. This weekend he called with health trouble---not huge, but bigger than a cold. The docs say he'll be fine, but I can't help but be worried. I remember the times you're talking about with my grandparents, and they were bad. At one point, I was visiting my grandmother by myself one summer and ended up having to drive her to the emergency room myself. Oh, those were bad days. Kate love love loves her grandparents. Me, too. My parents have never said a word about such things, but sometimes I feel scared about whether my son will get a chance to really get to know them. My father's father died when my father was eleven, but my other three grandparents were around to celebrate my college graduation (and for several years after that), and the two I have left now are only just starting to seem stereotypically old. (My grandma still goes hiking once a week.) This is very good luck, of course, but my chances were made better by being born when my folks were in their early twenties. Having waited until my mid-thirties to start parenting, I'm guiltily conscious that I need to cross my fingers hard and hope our luck holds.